A 6 day adventure through the best of northern Vietnam, enjoying fantastic scenery, warm hospitality and an authentic tastle of a superb country. During this 6 day tour, you will cycle on quiet roads through stunning scenery and traditional villages. Perfect for the active adventurer, this trip will have you biking through the best of northern Vietnam, passing the limestone karsts of the Mai Chau area and cycling through small villages for an authentic taste of Vietnam. You will overnight at a local Thai minority family’s homestay and learn more about their rural way of life. The highlight of the tour will be riding to remote villages in Pu Luong and arriving at Cuc Phuong National Park. There will also be an unforgettable visit to Trang An, more commonly known as the Ha Long Bay of the land. A fantastic 7 day mountain biking adventure on a north-west loop beginning and ending in Hanoi, giving you a insider's glimpse into the real Vietnam along with some wonderful biking. 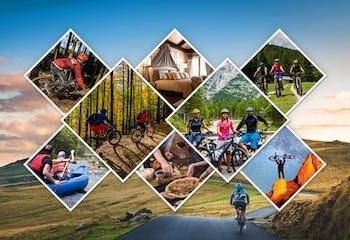 A fantastic 7 day mountain biking adventure on a north-west loop beginning and ending in Hanoi, giving you an insider's glimpse into the real Vietnam along with some awesome biking. This exciting tour offers challenging cross-country mountain biking and a wonderful opportunity to experience the traditional and varied lifestyles of the people of the spectacular country of Vietnam. Traveling in a small group and being led by a local English-speaking guide, you'll experience fantastic cycling and knowledgeable, friendly guidance from the people who know the country best. Explore peaceful Vietnam with an awesome 12 day itinerary through the country, cycling along the stunning coastline of southern Vietnam past turquoise bays, white beaches and palm tree-lined rice fields. Explore peaceful Vietnam with an awesome itinerary through the country, cycling along the stunning coastline of southern Vietnam past turquoise bays, white beaches and palm tree-lined rice fields. Discover the majestic Royal Tombs of Hue and ascend the Hai Van Cloud Pass for vast views of tropical mountains falling into the sea. Drift back in time while walking the cobblestone streets of Hoi An, a 2,200-year-old trading port, and relax and swim at the beach resort of Nha Trang. Mudgee is a mecca for food and wine lovers, and has an intense concentration of amazing cellar doors, and is almost completely flat, perfect for cycling. This self-guided tour offers great value, with 2 nights accommodation included, and will ensure you discover all the secret spots in this fantastic food & wine hub. You will visit famous cellar doors including di Lusso, Robert Stein, Robert Oatley and more. This delightful cellar door tour is a brilliant way to visit Mudgee and includes the best selection of food and wine outlets that the region is famous for. Gather up the tribe and head for the hills of Laos for a lively and thoroughly enjoyable 5 day exploration with the family. Pack up the entire clan and get set for a true family adventure over a memorable 5 days in the welcoming and intriguing country of Laos. Designed for families of all ages and cycling ability, the bursting itinerary will appeal to young and old, with a host of options available for biking through the spectacular scenery as well as a support bus traveling with you every step of the way, so there's plenty of travel choices for all. Treat your tribe to a magical and inspiring holiday, learning and immersing yourselves in the culture as you experience fun-filled and interesting days in the beautiful, unspoilt land of Laos. This self-guided cycling wine tour of Hawke's Bay is the perfect way to experience this beautifully abundant region of North East New Zealand. Hawke's Bay is a surprising sun-soaked area, enabling you to forget the car and enjoy the incredible wines on offer in the oldest wine region in New Zealand. This is a self-guided tour, but help is never far away. A support vehicle is available on call and everything is arranged for you so you can cycle, relax and enjoy your holiday. This tour starts and ends in Napier, the beautifully and undeniably unique Art Deco city situated on the charming coast. While Japan may be seemingly gripped by an obsession with the modern world it still retains a fascinating traditional culture. Join this special cycling adventure that soaks up those traditions as you pedal out of the ancient city of Kyoto, marvel at the world renowned cherry blossom trees, and meet the monks atop mountains who lead such a unique way of life. This is a journey that truly shows off Japan’s history, beauty and culture. The best way to cover the whole city, see beautiful parks, and learn about history, architecture and Czech culture! The most comprehensive one-day tour of glorious Prague. This tour is an easy ride for tourists of all ages; bikes, helmets, maps and other accoutrements are included in the tour price. Your tour is hosted by knowledgeable, English-speaking guides who will take you on a delightful, easy-paced voyage through one of the most beautiful cities in eastern Europe. Immerse yourself in the fascinating culture and beautiful landscapes of lovely Laos on a compact five day expedition through the majestic highlands. Sample a slice of Lao mountain life as you cycle through villages, dwarfed by the lush limestone peaks that proliferate this spectacular region. Experience fantastic gastronomic delights, great company and comfortable lodgings on a five-day cultural discovery tour through Laos. Take on a breath-taking cycling challenge, as you power through Xieng Khouang Province, home of the highest peaks in Laos and arguably some of the most phenomenal landscapes in the country. Discover the wonderfully eerie Plain of Jars, an ancient archaeological heritage site bathed in mystery, and chill out in the laid-back, beautiful town of Vang Vieng. A fine way to spend five days! Explore the stunning Inle Lake by bike, boat, and kayak, visiting the colorful communities surrounding and even floating on it. Ride the hidden trails far from crowds, travel canals and wind your way through the floating gardens aboard a long-tail boat, and kayak amongst stilt villages to discover the quiet side of Inle.